Protestors were out in full force day one of the convention Monday- hundreds of people rallied across the Cleveland and marched through the city. 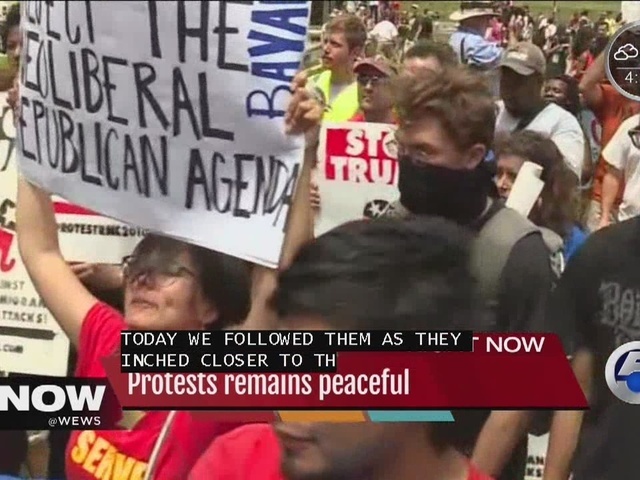 NewsChannel 5 caught up with dozens of people protesting- all from different organizations, representing different religions and beliefs, and coming from across the country to march in Cleveland. Most people told NewsChannel 5 they are gathering here in Cleveland to take a stand and make their voices heard. "We stand for peace justice and equality," Tom Burke, a leader of The Coalition To Stop Trump said. The Coalition To Stop Trump organized a rally and a march that multiple anti-Trump groups joined Monday. Cleveland Police followed closely on bikes, sometimes barricading certain streets, but did not have any issues.